1. 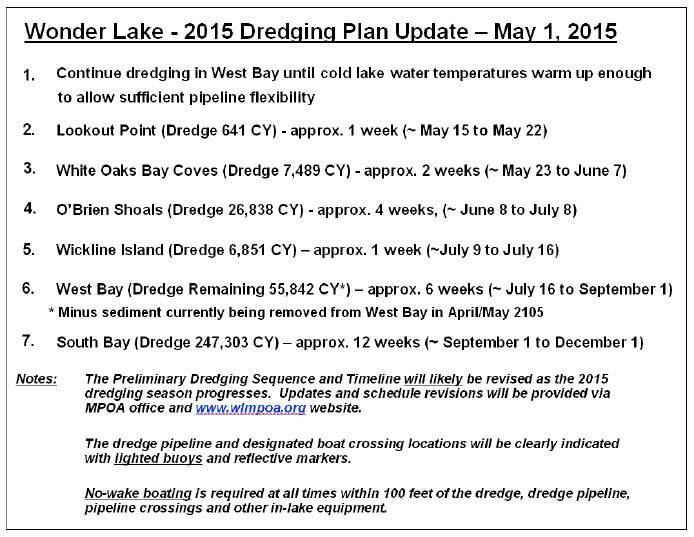 As spring slowly arrives, the MPOA has been working with our consultant and dredging contractor to update the plan and schedule for the 2015 dredging season. The primary goals of this plan are to minimize lake-user conflicts in the 2015 dredging season, and to allow the contractor to work as efficiently as possible. 2. The dredging contractor remobilized and resumed dredging in mid-April, 2015, first deepening very shallow areas of West Bay needed to allow the dredge pipeline to float freely. 3. However, the recent spell of cold weather has prevented them from moving to White Oaks Bay and Lookout Point, as the dredge pipeline, with one inch thick sidewalls, has less flexibility when water temperatures are below 55 degrees. Any attempt to re-locate the pipeline while water temperatures are below 55 degrees increases the chances of cracks developing. 4. As a result, for the present, the dredging contractor will continue to work in the portions of West Bay under contract to be dredged until water temperatures rise. 5. They are then proposing to first work on Lookout Point and then White Oaks Bay Coves, tentatively completing that work by the second week of June. 6. The contractor would then move up the lake to work on O’Brien Shoals and Wickline Island, hopefully completing that work by mid-July. 7. The contractor will then move back into West Bay / Nippersink inlet, so that the main body of the lake will be “pipeline-free” for the remainder of the boating season. 8. Upon completing West Bay, they will then work on South Bay until the project is complete, hopefully by late Fall, 2015. 9. 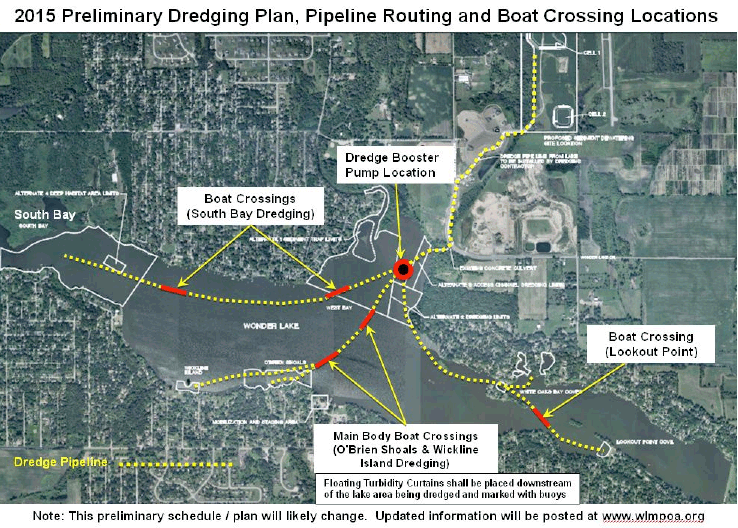 Marked “boat crossings” will be created by the contractor in each of these dredging phases, to allow boat traffic to safely cross the dredge pipeline. 10. In all areas proposed for dredging (with the exception of the Nippersink Creek inlet), the proposed dredging will come no closer than within twenty (20) feet of the shoreline. If your pier is shorter than 20 feet in length, you will likely NOT have to move your pier to allow dredging to occur. In the narrower portions of the Nippersink Creek inlet, the dredging will come no closer than ten (10) feet of the shoreline. Where possible, lakefront landowners / subdivisions in areas to be dredged should avoid installing their piers until after dredging in their area is completed, particularly if they are more than 20 feet long. Any piers extending into areas slated to be dredged will need to be removed before dredging starts, or the amount of dredging conducted in those areas will be reduced. Information on when piers would need to be temporarily removed in those areas will be provided to affected landowners as the dredging timeline is updated. 12. No matter how the contractor proposes to schedule the work, there will be those who feel they are being inconvenienced. All we can do is ask for folks to look at the big picture (a cleaner, deeper lake), and be patient. Proposed Sediment Drying Facility Location Has Changed! SSA # 9 Bonds Have Been Sold! USGS McHenry County - Interactive Mapping for McHenry Co.